Maryland Pink and Green: It's a Sunshine Day! Do you remember those groovy Brady kids and that great song "Sunshine Day?" I have given been the Sunshine Award by my sweet new friend, Bevy at It's a Golden Day. Like Bevy said, "Maybe I should put on my Sunday best and go to Sears!" 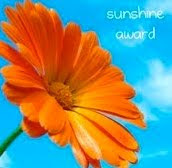 The Sunshine Award is given to bloggers whose positivity and creativity inspire others in the blog world. I’m now going to pass along the sunshine and present this award to some of my favorite bloggers who make my day "A Sunshine Day!" 3. Link the nominees' blogs so others can get to know them. Hope everyone has a SUPER Sunshine Day! Thank you so much!!! Can't wait to pass this one on! Hysterical!! Put on my Sunday best and head on over to Sears - that is absolutley LOL!!!!!!!!!!!!!!! I will get to work passing this on tomorrow FO SHO! Didn't you LOVE the youtube video? Fun, fun, fun! Thank you Bethany for thinking of me! You are so sweet!